When will I get my order? : Orders take 8 business days to process; add ship time from NY. View this map (Click here for map) to calculate shipping time. 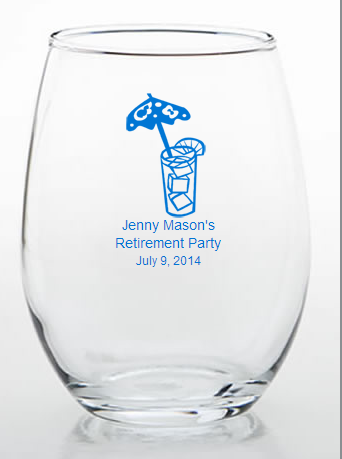 Custom glass favors for retirement party guests will give them a lasting keepsake of your event. Give the guest of honor a proper send off by celebrating him or her with custom trinket holders. They can be used as table decorations or party supplies simply by adding colored candy to them. THIS DESIGN IS IN THE EXCLUSIVE DESIGNS SECTION. 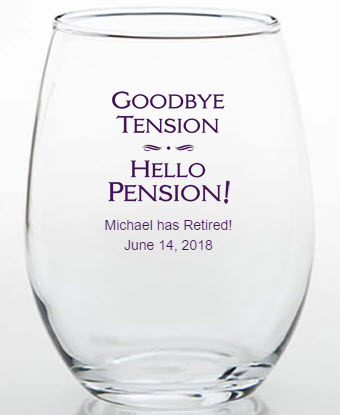 Each measures 3.75 inches tall and 2.5 inches in diameter, with a 9 ounce capacity, in the hot new stemless wine glass design ? great for not tipping over or breaking the stem! These glasses also work well for use as a unique dessert glass. Made in the USA, each is made of clear glass and they're perfectly fitted to be silk screened with amazing accuracy directly on the glass in a wide variety of all occasion themes, designs, colors and titles that match your theme and your personal preferences. Sure to be a hit, these wine glass favors come bulk packed. You can also create your proof online. Boxes are available for an additional .70 each. They are shipped flat for you to package your glasses. 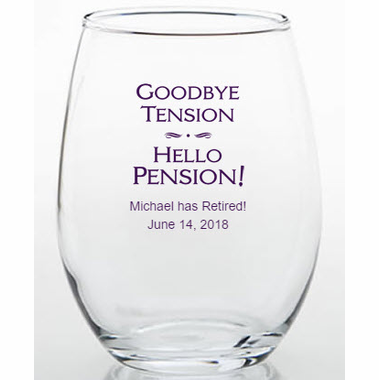 Please be advised there is a one time $35 personalization fee for all the glassware orders; a custom made printing plate is required for the glassware orders, and the fee for this is $35. This fee will be automatically added to your cart. The quality of the wine glasses was excellent. I was very happy with them. Custom Mini Hand Sanitizers - You place labels on bottles.